MOTÖRHEAD’s Aftershock did not only act as another stellar addition to the band’s legendary catalog, but is widely regarded as one of the best musical releases of 2013. Aftershock marked MOTÖRHEAD’s biggest selling first week and highest US chart debut numbers to date. 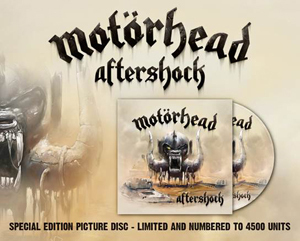 You can order Aftershock now in Limited Edition Digipack format via Amazon.com. The album is also available in regular CD format and vinyl (gatefold – 180-Gram Single LP). Catch MOTÖRHEAD performing with MEGADETH and ANTHRAX on the first annual MOTÖRHEAD’s Motörboat cruise onboard the Carnival Ecstasy from September 22-26, 2014. In addition to these three rock giants, “The Loudest Boat In The World” will also feature performances from ZAKK WYLDE, JIM BREUER, DANKO JONES, FIREBALL MINISTRY, WILSON and some big surprises. More bands are set to be announced soon. Tickets for MOTÖRHEAD’s Motörboat, as well as full details and cabin pricing, are on sale now at www.MotorheadCruise.com. Make sure to also pick up your copy of the Ronnie James Dio tribute compilation This Is Your Life, which features the track "Starstruck" covered by MOTÖRHEAD with Biff Byford of SAXON. The compilation hit stores on April 1, 2014 via Rhino.